Under vacuum conditions, ranging 5 to 80 Pa, orthogonal experiments were conducted by controlling the distillation temperature and holding time to study the lead vapor condensation conditions and nucleation growth mechanism. 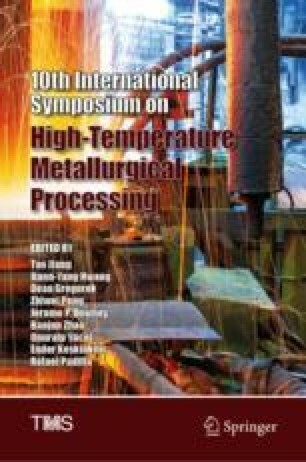 The results showed that the condensing temperature range of lead vapor concentrates in the region between 510 and 720 °C. Among them, the condensation effect was best in the region from 550 to 660 °C, and more than 80% of the lead condensed in this region. When the ambient pressure changed from 5 to 80 Pa, the temperature of the lead vapor condensate would change around 50 °C. By scanning electron microscopy, the condensation of lead vapor was found to be droplet condensation. The presence of temperature, pressure and gas all affected the nucleation and growth of lead. As the degree of undercooling increases, the condensed particles of lead gradually decreased. The authors were grateful for financial support from the National Nature Science Fund of China (grant NO. 51,504,115), the NSCF-Yunnan Joint Fund (grant NO. U1502271) and the National Key Research and Development Program of China (grant NO. 2016YFC0400400).